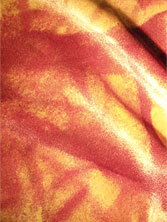 Off-white viscose/silk mix velvet. Ideal for the devore technique when the viscose pile is taken away leaving the silk backing. The colours take wonderfully when dyed with Procion dyes.